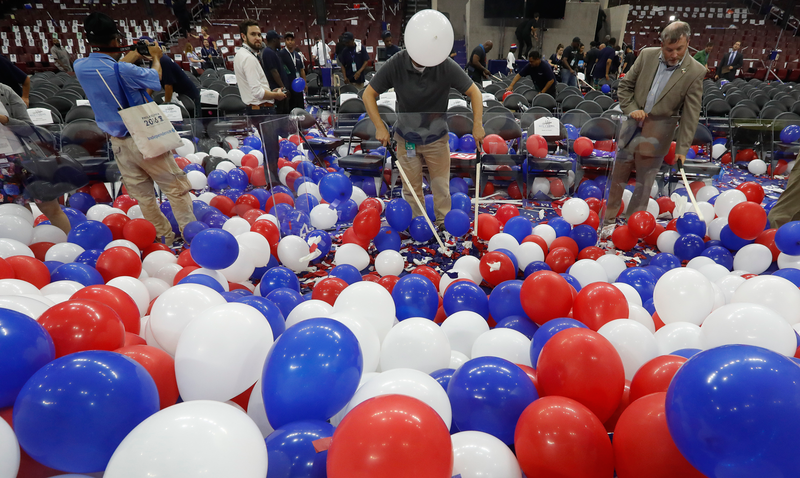 After eight days of American flag lapel pins and canned applause lines, the major political parties’ nominating conventions—the Republican National Convention (RNC) and the Democratic National Convention (DNC)—have finally come to an end. As many observers long expected, the Democrats selected Hillary Clinton, a former senator, Secretary of State, and First Lady of the United States, as their candidate for the White House. And as no one predicted until the moment it happened, and maybe not even then, Republicans sensibly responded by tapping noted wall enthusiast and former beauty pageant magnate Donald J. Trump. If you wisely decided against spending the last two weeks of your life staring at nine-person cable news panels that effortlessly put Sunday morning NFL pregame shows to shame, here is what to know as we plunge deeper into our collective national fever dream. Which politician made it out of the Trump Show surprisingly unscathed? In a delightful twist, that would be primary loser Ted Cruz, whose in his primetime speech urged Republicans to cast their ballots for the candidate who will respect conservative values and uphold the Constitution. That candidate, of course, is—nah, psych. Cruz refused to even utter the man’s name, instead exhorting stunned attendees to “vote their conscience” before striding quickly offstage. Since a principal function of conventions is uniting the party behind its nominee, a high-profile member’s open refusal to endorse said nominee is a big deal. Chaos ensued: Cruz was booed lustily, and one too-woke GOP donor was restrained from confronting him backstage, which was a letdown, since the only thing better than an NBA-style “hold me back” fight is an NBA-style “hold me back” fight between men in poorly-fitted Jos. A Bank suits. Which politician took the biggest, saddest L? Chris Christie. In February, the single greatest contributor to New Jersey’s per capita hamburger consumption became the first GOP presidential hopeful to endorse Trump, reasoning that if Donald was going to pull this thing off, Christie could at least get in on the ground floor. This gamble went poorly: by the time the convention rolled around, the governor had been relegated to alleged fast-food lackey, passed over as running mate, and slotted to speak directly before Trump’s daughter Tiffany, who the Republican National Committee billed as a “model, singer, and influential presence on social media.” Life comes at you fast. I get that this is political theater. But still, although I don’t remember much from law school, this is basically the exact opposite of how criminal adjudication works. The whole unseemly charade would have been more upsetting if it weren’t so embarrassing—in four years, Christie went from rising Republican Party star to a term-limited politician who frittered away all his political capital at the altar of the guy from Celebrity Apprentice. At this rate, expect Christie to mope through those Nutrisystem infomercials alongside Chris Berman by 2019 at the latest. Which Trump Kid was the most impressive? Trump’s functionally identical large adult sons, Donald Jr. and Eric, turned out to be off-brand Winklevoss twins who managed to assert with straight faces that their father, a man who has been obsessed with making money for his entire life, has actually cared about blue-collar jobs all along. Tiffany did about as well as anyone could expect from a 22 year-old forced to speak to millions about a dad who only sort of knows her. Barron isn’t old enough for nationally televised speeches, but did get to stay up past his bedtime for four straight nights, so that’s fun. By comparison, Ivanka Trump came off as personable and comfortable when introducing her father. But her remarks, which fiercely condemned the gender wage gap and discrimination against working mothers, would merit more praise if he espoused any of the beliefs that she claimed. I laughed out loud when Ivanka announced, to wild applause, that the Trump Organization does not “shut out” female employees who have children, both because Donald’s record on this point is not great, and because she seemed genuinely proud that the company complies with basic federal employment law. Ivanka has a future in politics, but based on her apparent issues of choice, she should keep her options open as free agency approaches. Who might take on the impossibly difficult task of following Joe Biden? For Republicans, it’s Mike Pence, the uber-conservative governor of Indiana who was still a smoking kills truther in 2000, which just goes to show that people will truther anything. Although Trump was never going to select someone with whom he might have to share the media spotlight—sorry, Newt—neither Pence’s subdued convention speech nor his deeply awkward TV sit-down revealed much else about him. Pence enjoys good approval ratings in his home state, so it’s a bit surprising that he was willing to tie his political future to Trump’s, especially given that he had to end his reelection bid in order to do so. If Trump flames out spectacularly between now and November, he and Chris Christie can commiserate over drinks. Across the aisle, after some fun speculation about Elizabeth Warren, Cory Booker, and the Two Toms (Vilsak and Perez), Clinton picked Tim Kaine, a middle-aged white guy from a swing state, to be her running mate. Kaine, a respected senator (even Ted Cruz likes him) and charmingly wacky dad, is a perfectly reasonable pick. But it’s also safe and boring. By being just a bit bolder and selecting a progressive like Warren, Clinton might have helped nudge bummed-out Sanders supporters into the Clinton tent. Plus, this ticket of brilliant, experienced women would have allowed Democrats to present voters with as clear an alternative as possible to Donald Trump. So what gives? Clinton’s camp probably had to think hard about how Trump would attack this pair and incessantly tweet-label them as shrill and weak. The Kaine pick, at least in part, tacitly acknowledges that when a candidate hopes to overcome a deeply entrenched social stigma, their task will be easier with someone traditionally “presidential” at their side (see also: Biden, Joe, 2008). Clinton’s nomination is a wonderful, historic moment—shoutout to my mom, who might still be crying—but even so, friendly reminder that female candidates still must bear a deeply unfair burden in American politics. Just how depressing did the RNC get? How do the DNC hacks play into this, if at all? Last Friday, the zany jokesters at WikiLeaks released some 20,000 emails quietly lifted from Democratic National Committee servers, many of which show that its ostensibly neutral staffers openly preferred Clinton to Sanders throughout the primary process. This is deeply embarrassing: since the Committee’s job is to work and raise funds on behalf of all candidates, high-profile employees disparaging Sanders long before the nomination was decided is not a good look. Plus, the party has enough trouble with email management as it is these days. The most alarming part of this story is the who. Preliminary evidence indicates that state-sponsored Russian hackers are behind the breach, and the Clinton campaign has theorized that the release’s timing was selected to give Trump an electoral boost. Shadowy Russian intelligence meddling in U.S. domestic affairs admittedly sounds like an overwrought House of Cards story arc that goes nowhere after three episodes. But since Trump has offered up a startlingly (and terrifyingly) pro-Russia agenda of late, you can see why President Putin, in theory, might be very interested in dealing with President Trump going forward. All that said, so far, the file review has yielded no evidence that DNC resources were actually used to elevate Clinton over Sanders, so it’s hard to charge the DNC with anything more than breathtakingly poor judgment. (Again, so far—further releases are likely.) From the Democrats’ perspective, far worse than temporary humiliation is the intraparty schism the emails could create. Sanders backers now see confirmed in black and white their long-held suspicions that the national party never took their man seriously. Clinton’s post-convention challenge will be to convince these already-disappointed voters to support a candidate for whom, in their view, the process was rigged all along. Wait—Bernie bros ARE going to support Hillary now, right? Of course, Clinton is not the only alternative, and some Sanders die-hards have vowed to back a third-party candidate, arguing that their votes should not be cynically conscripted to prevent a Trump victory. It’s unrealistic to expect them to shrug good-naturedly and quietly transmogrify into full-throated Clinton backers. But this argument is willfully blind to the concept of “consequences.” It’s roughly equivalent to bailing on your boring job because you just feel like it, and then being shocked when you come back two weeks later to a cleared-out cubicle. Sanders, to his credit, gets it. Although disappointed with the outcome—which, alright, fair—the man improbably shifted the Democratic discourse well to the left, and the inclusion of the $15 minimum wage and other formerly fringe issues in the party’s platform shows that he didn’t need to win in order to succeed. Sanders has also begun to gently urge potential defectors to consider how they would explain a Trump presidency to their children—which, alright, ALSO fair. As the sting wears off and the possibility of Supreme Warlord Trump looms increasingly large, expect a little old-fashioned pragmatism to prevail. Speaking of which, how likely is a Trump presidency? A fair question, given how polls have tightened in recent weeks. Trump’s surge can be attributed in part to the post-convention bump, since staunchly Republican voters who were previously on the fence about Trump have now resigned themselves to voting for him in the fall. The smart people at FiveThirtyEight pin Clinton’s chances at just over 60% as of press time, and unless you believe that Trump has a real chance over the next few months to convince significant chunks of 2008 and 2012 Democrat voters that he, not Hillary, is President Obama’s ideological heir apparent, a Trump presidency is not especially likely. Important disclaimer, though: few people ever thought Trump would make it to this point. Don’t put anything past him, and be sure you’re registered to vote. What can we expect from the next three months? Upon securing their party’s nomination, candidates typically “pivot to the general,” softening their more partisan positions to appeal to those elusive, possibly-mythical swing voters who could be convinced to cast their ballots either way. As seen in DNC speakers’ repeated calls for inclusiveness and national unity, Clinton’s pivot is already in progress. Yes, some speakers fired off an initial salvo of attacks on Trump—by the time President Obama had slowly worked his way to that vicious “homegrown demagogue” punchline, I was ready for him to bark “GOD’S SON ACROSS THE BELLY” and stroll offstage to the “Ether” instrumental. But the week’s best and most memorable speech came from First Lady Michelle Obama, whose emotional appeal to optimism—“When they go low, we go high”—will likely characterize the Clinton campaign’s approach for pitching her to the general electorate. While his opponent moves toward the middle, Donald Trump—prepare to be shocked—has shown no interest in doing any of this. The morning after accepting the nomination, he held an unhinged press conference in which he again suggested that Ted Cruz’s father had something to do with the Kennedy assassination. On Wednesday, he called on Russia to steal and publish Clinton’s emails, despite the fact that encouraging agents of foreign governments to break U.S. law is not a traditional hallmark of presidential candidates. But Donald Trump views his political outsider status as an asset, and he just secured the Republican nomination on the strength of this argument. Do not expect him to pivot (or do any Career Politician Things) anytime soon. Whatever the result come November, it’s going to be a loud, tense, and surreal summer. Register to vote, and pick up some canned goods, just in case.